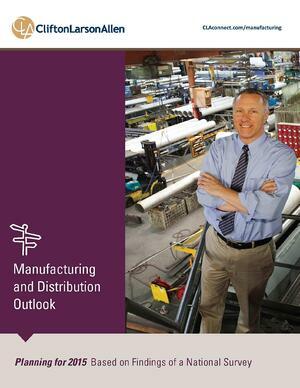 Accounting firm CliftonLarsonAllen recently released it's "M&D Outlook 2015" report which featured results of its extensive survey of manufacturers. It contained some noteworthy data for manufacturing companies. Global expansion simply isn't a priority component of growth strategy for most M&D companies. The internet is seen as the source for most new business activity. Only 2% of respondents indicated that Revenue Growth was a target of their continuous improvement efforts. That's a shame! The same methodology that resulted in vastly improved manufacturing operations could yield notable revenue success as discussed here. Mirroring earlier McGladrey research, companies tend to begin selling globally only in response to existing customer requests, not a proactive market growth initiative. Concentration risk is rampant! "42% of respondents indicated that their top 5 customers comprise greater than half their revenues." Only 6% had completed an acquisition in the last 6 months - they're focused almost exclusively on organic growth. Most say they are trying to increase diversification within their existing customer base. "Pricing and margin compression" are the biggest concern cited by M&D companies as they look out over the next two years. "Continuous Improvement" is their primary tool to improve in areas they want to improve. And yet when asked to choose "2 top priorities", margins don't make the list and "increased sales" and "market development" fall at the bottom (1% ea.) long after plant capacity (39%), product development (33%), diversification (24% - but among existing customers), workforce development (20%), IT (20%), leadership development (13%), new technologies (13%), repair and maintenance (12%), and acquisitions (10%). Here's what jumps out. M&D companies have a toolbox filled with hammers (operational execution tools.) And so guess which problems they're working on? Those that look like nails! Industrial B2B, manufacturing & distribution companies are great at making stuff. If you had good stuff you used to be able to sell it. That's changed. But growth strategy typically hasn't. But the natural inclination when you're under pressure is to return to your areas of expertise. And that's what this survey data illustrates. Companies that are most concerned about the impact of pricing and margin compression on their business viability are going to....wait for it....add plant capacity. What? Of course there's a rationale that increasing capacity will allow you to drive down unit costs and respond to pricing and margin pressures. But in order for that to work, you've got to economically sell the new volume (leverage the capacity without increasing your SG&A disproportionally to do so). Otherwise you end up with a larger burden of fixed costs which exacerbate the challenge. 3 facts frame the revenue growth world for today's M&D companies. What's needed is a workable plan that feels comfortable and targets the fundamental issues. build on the domestic revenue growth activities to opportunistically open international sales opportunities. In other words grow globally in the way that companies find naturally comfortable - but do it deliberately. It's not complicated - it's complex. And it's an approach which companies naturally focused on operations can embrace....if they will be introspective enough to recognize the dissonance between their concerns and their business investment plans. You ready to actually focus on the areas that worry you...but you've been unsure how to tackle? Let's talk, and start by downloading our free eBook on revenue growth for manufacturers.